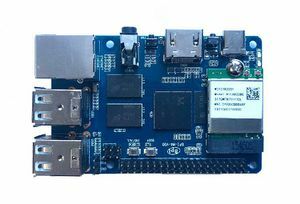 Banana Pi BPI-M4 use Realtek RTD1395 chp design ,it is a 64-bit quad-core A53 mini single board computer. It features 1 GB of RAM and 8 GB eMMC. It also has onboard WiFi for b/g/n/ac and BT 4.2. On the ports side, the BPI-M4 has 4 USB 2.0 ports, 1 USB TYPE C port, 1 HDMI port, 1 audio jack. 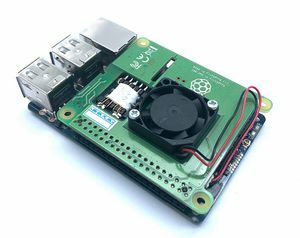 support M.2 Key E PCIE 2.0 interface. 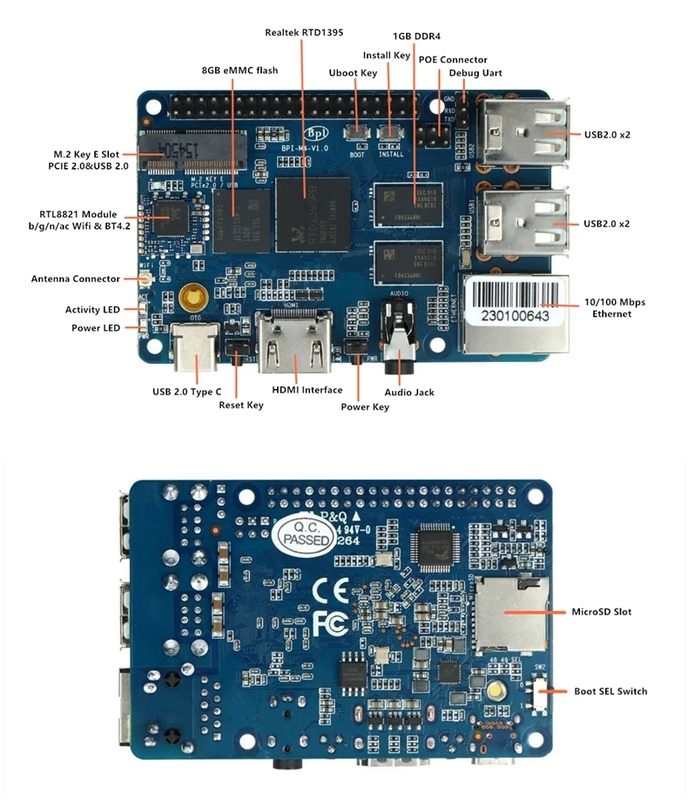 The RTD1395 is equipped with a high-performance quad-core CPU,ARM cortex-A53,with 512K L2 cache embedded. the RTD1395 also integrates and efficient ARM Mali-470 Graphic Processing Unit(GPU) to accelerate 2D and 3D graphics processing. For acceleration of this OSD and 2K user interface,the built-in Streaming Engine of the RTD1395 provides commonly used drawing functions.the CPU is dedicated to applications ,while most of the functions of the RTD1395 is dedicated to manipulating,decoding video streams in vaious formats.e.g. decoding 4K2K H.265,Full HD MPEG1/2/4/H.264/H.264 MVC,AVC/VC-1,VP8,VP9,AVS,AVS plus,HD JPEG,etc. Video DSP can also handle encoding of up to Full HD with H.264 format.Video decoding and encoding can run simultaneously. The header CON2 is the UART interface. For developers of Banana Pi, this is an easy way to get the UART console output to check the system status and log message. This page was last edited on 27 February 2019, at 18:25.